Certain American and other non-EU citizens vacationing or intending to illegally work in Greece may need to show Greek authorities they have at least 50 euros a day for the length of their stay. An interior ministry decision published in the Government Gazette on December 31, 2007 states in Article 1 that non-EU nationals traveling to Greece with a Schengen visa must show upon entry that they have at least 50 euros for each day of their stay, or a minimum of 300 euros for up to five (5) days. Non-EU minors need a minimum of 25 euros per day. Article 2 says that non-EU citizens entering Greece with a national visa — a visa granted by Greece for entry to Greece only — with a validity of up to 90 days must have at least 300 euros for the entire length of their stay, whether it is one day or 90 days. The amount increases to 30 euros a day for anything beyond 90 days. Finally, Article 3 says that the above two rules are in effect for non-EU citizens who are from countries that impose the same requirements on Greek citizens. Meaning, this legislation was written to retaliate or prevent against certain countries targeting or planning to target Greek citizens. However, border police can still question anyone from any country at anytime for any reason. Whether or not this applies to you, or authorities actually request that you show a credit card or cash at the border/airport, 50 euros a day is an accurate estimate of how much travelers to Greece need for food, transportation and sightseeing. Getting by on 20 euros a day is unrealistic. An incomplete version of this story in an English-language weekly newspaper misled readers — particularly Americans — to believe the 50-euros-a-day rule applied to all non-EU citizens. It does not. It applies to non-EU citizens from countries that target Greek citizens, “undesirables” trying to live/work in Greece illegally, hooligans and citizens from western countries (Americans and Canadians) who overstay their visa. The number of U.S. tourists to Greece increased to nearly 436,000 in 2007, and the Greek tourism sector is a growth market that accounts for almost 20 percent of this country’s GDP. Americans also spend more money in Greece than any other nationality. This country would be ill advised to impose monetary restrictions on all non-EU countries, and this is why I investigated further. 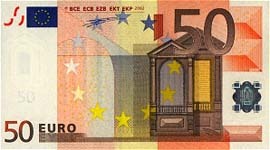 The 50-euros-a-day topic was opened on posting boards, where more misinformation and rumors spread. These rules are not amendments to existing legislation in law 3386/05 regarding a minimum financial requirement, as none existed previous to December 31, 2007 (I read it). It is a new addition. It is also not guaranteed that being clean shaven, well spoken and neatly dressed will absolve you from being checked. Whether you are questioned is purely the discretion and mood of border authorities and passport control. A lot of Americans, Canadians and other non-EU travelers who come each summer to work illegally in island bars and restaurants account for the highest number of overstays in Greece. “Overstaying a visa in Greece” is one of the most popular posts on this site in summer, and there are a number of Americans, Canadians and other non-EU citizens posting in forums requesting advice and job leads specifically for Greece, not Germany, Sweden or Spain. It is illegal to work in Greece as a traveler. Therefore, Greece and other EU countries are within their right to discourage “undesirables” and question or demand proof of financial support from anyone they deem suspicious. * Upon learning my profession, certain countries have requested proof of financial means, a handwritten and signed statement that I promise to not work in their country, and the confiscation of some of my possessions. This happened in the UK, Germany, Hungary, France, India, Egypt, Mexico and the former Yugoslavia. I provide this as an example that border police can question anyone at anytime for any reason, then decide to allow passage or turn someone away. Their actions need not be supported by written law. * I urge you to read Dubai Billy’s comment attached to this post, which details what happened to his stepson. His story illustrates that a non-EU citizen may be asked to show 50 euros a day even before a visa is issued. Absolutely foolish. Why would I or anyone want to carry large amounts of cash around. HELLO, we’re in the 21st century. Unless of course they truly do allow you to show a credit card, but then again, do they verify your limit? Interesting. Are more professions susceptible to the sort of questioning and requests you received in UK, Germany, India, Egypt etc? I think that besides preventing damned xenoi from entering Greece if they can’t spend at least 50 euro per diem, they should also expel all greeks who can’t spend the same. The S – It used to be that great amounts of cash weren’t necessary because traveler’s checks were more common and widely accepted. As that’s no longer true, an ATM or credit card usually suffices. They don’t check your credit limit. 3ni – I don’t know which professions are more susceptible, that’s a question for border/passport control. I didn’t ask because it was my vacation and arguing or appearing difficult wasn’t going to make life easier for me. I believe I was targeted because of my citizenship combined with the stamps in my passport and my job. A – If I didn’t have a permit to live here, they’d have to turn me away since I wouldn’t be able to meet that monetary quota. How can I? My Greek salary doesn’t pay me that amount per day. You are lying in order to discredit us – Greece has no problem with overstays as long as they’re blond, good looking and prone to alcoholic intoxication. Exception is being made for well-natured cats. My step-son had a problem with this last year. He and his girlfriend were coming out to spend three weeks on Skopelos with us – we had done the invitation stuff along with the attested photocopy of the document which says we own the house – we had the affidavit from the solicitor that they were coming to stay with us – jumped through all the hoops so that they could come. He took all the stuff to the Greek Consulate in durban (South Africa) and they demanded to see the 50 euros per day before they would even issue him with a visa. Gold Card – HA! Not interested. No, he had to draw the South African Rand from his bank account, convert it to Euros and take it to the consulate. He then put it back in his bank account – he incurred charges changing rand to euros, incurred charges changing euros to rand, and all just to satisfy a clerk that he had money. Of course, my step-son is a total little s*#t and known trouble maker with a criminal record… well, actually no, he isn’t, actually he is a 31-year-old airline pilot and an extremely respectable person. So I ask again – doesn’t Greece want tourists?